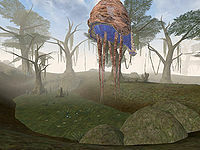 The Bitter Coast, named for the salt marshes along the coast, was the part of Vvardenfell's coast nearest to the mainland of Morrowind. 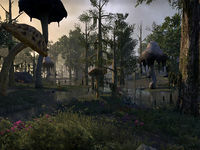 This largely uninhabited area was in the far southwest of Vvardenfell and lay between the mountains of the West Gash to the east and the Inner Sea to the west. The northern boundary of the region was generally considered to be marked by Khartag Point just north of Gnaar Mok, and it followed the coast south and eastward through the tiny fishing and smuggling village of Hla Oad and the Imperial outpost at Seyda Neen, finally merging into terrain more reminiscent of the Ascadian Isles just west of Vivec. This page was last modified on 20 January 2019, at 17:00.